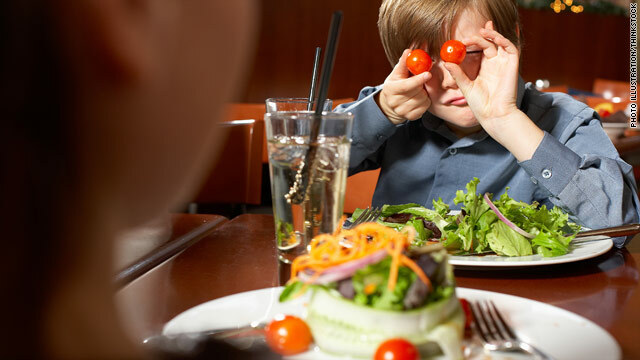 Not all children have been taught the manners necessary to ensure that everyone at a restaurant will enjoy the experience. (CNN) -- First, it was babies in bars. Now, children in fine-dining restaurants are feeding a raging debate. The argument is fueled by new efforts of some Michelin-starred New York restaurants like L'Atelier de Joel Robuchon and Café Boulud to cater to the under-3-year-old crowd. Some are upset at the parents of the young diners, but others believe that even adults don't always behave in ways that allow customers to enjoy peaceful dining. More than 100 people -- mostly against the idea of tots at upper-echelon restaurants -- posted their heated comments in response to Shivani Vora's recent New York Times piece, "Fine Dining Where Strollers Don't Invite Sneers." "People who force their toddlers on others in enclosed public spaces like fine restaurants (and airplanes) are even more selfish than those who insist on talking on cell phones in such places," one Times reader said. "If you object to 'howls' (based on your ridiculous presumption that all children inevitably howl), let's start by excluding all the adults who are yelling into their cell phones, are drunk and/or obnoxious, etc." another commenter said. "I'm with the majority -- thanks for this list, because now we know which high-end restaurants we will never set foot in," another said. That's certainly the customers' standpoint, but what about those manning the stoves and host stands? Many chefs and restaurateurs with families are teaching their own children to be good restaurant citizens and are making accommodations for kids in their establishments. Marc Murphy, chef and judge on the Food Network's "Chopped" series, created children's menus at all three of his New York City restaurants so his two children, ages 3 and 5, have dining options on their nights out. At Landmarc, adult diners can enjoy Murphy's foie gras terrine or roasted marrow bones while their booster-seated offspring have the option of ordering orecchiette (a type of pasta), grilled lamb chops, peanut butter and Nutella sandwiches or petit filet mignon. Michael Anthony, executive chef of Michelin-starred Gramercy Tavern and a father of three (including a newborn), is even more accommodating. "When my own children are in the restaurant, I've sent them soufflé crackers with what looks like little frogs' tongues. I've sent out a beet dressed as a mouse," Anthony told CNN. Anthony also works with a New York public school, P.S. 41, offering lessons in table manners to first-graders. There are also hands-on cooking activities, a tour and lunch at his restaurant, as well as visits to the Greenmarket, an open-air farmers market -- all experiences geared toward establishing a fundamental understanding of where food comes from. "They're very impressionable and starting to form their opinions about food. We want to impress upon the kids that food is fun," Anthony said of the program. Teachers in the program particularly focus on younger diners developing a "restaurant voice," teaching children that restaurants are a busy place and that certain manners differ from when one is out playing tag in the park. This notion is especially poignant at Gramercy Tavern -- which Anthony will admit is a fine dining establishment -- as there won't be stroller valet any time soon. "It's not a restaurant adapted to children; it's a group of people who are warm and welcoming," Anthony said. The haute tots are, after all, children -- with an average attention span of three to five minutes per calendar year of their age. Anthony says he has invited particularly antsy adolescents back into the kitchen to focus their attention after they have created a disturbance. "As with any performance, practicing before a big event, such as going out to a restaurant, is a good idea," advises Sue Fox in "Etiquette for Dummies" in a chapter on Tips for Children and Teens. "I know of people who dress their kids up, sit them down at the family dining room table and hand out homemade menus to practice eating out."